Mary's seventh book is now available in New Zealand bookstores, online at Potton & Burton publishers, or by e-mailing through this website.
" Lake Tekapo, with it's dazzling blue glacial water and backdrop of the Southern Alps, is one of the major drawcards of the South Island's Mackenzie Country. While most people's experience of Tekapo is the bustling tourist village at the foot of the lake, there is also another whole community beyond, the legendary high-country stations that farm the sweeping tussock country that is typical of the Mackenzie. This book tells the stories of these courageous and tough farming families, who choose to live and work in this spectacular, but unforgiving country with its extremes of cold and heat, devastating snowfalls and huge winds. Heavily illustrated with both contemporary images and many old, previously unpublished photographs, this is a fascinating and beautiful book. 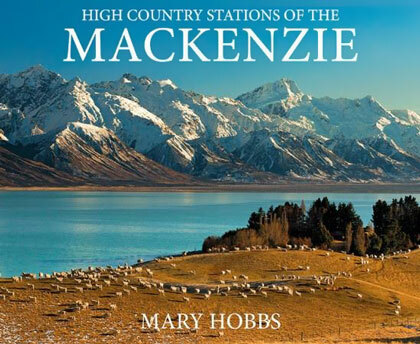 It is a sister volume to Mary Hobbs's bestselling High Country Stations of the Mackenzie, which focused on the stations around Lake Pukaki, and will be another much-loved addition to the legacy of New Zealand writing about the high country. " Mary’s sixth book is available in New Zealand bookstores and online at Potton & Burton publishers, or by e-mailing through this website.
" To most New Zealanders, wherever they live between Auckland and Bluff, the Mackenzie Country remains one of those heartland places that contributes much to our sense of self, with its vast expanses of tussock and sheep, glacial lakes, huge skies and the Southern Alps rising up to the west. But the reputation of the Mackenzie also owes much to the courageous, tough and tenacious people who first settled the high country stations of this area and who continue to farm to this day. In High Country Stations of the Mackenzie, long-time resident of the Mackenzie Country, Mary Hobbs, tells the story of 11 stations, mostly from around the Lake Pukaki area, which include such legendary runs as Irishman Creek, Mount Cook Station, Braemar, Tasman Downs, Ben Ohau, Simons Hill, Birch Hill, The Mary Range, and Glentanner. In unravelling the history of these stations, Mary has talked to many of the current station-owners to document their contemporary stories, while also uncovering many lost historical tales. Heavily illustrated with both contemporary images and many old, often previously unseen photographs, this is a captivating and fascinating book. Full of stories of courage and determination, tragedy and hardship, but also humour and triumph, this is another heartfelt contribution to a long New Zealand tradition of writing about the high country. " Christchurch Dreaming is a book full of optimism. It has been created by those who have known this region as home and is for people who love all that is great about Christchurch and Canterbury. In pictorial and written form, it takes the reader on a journey from its early years of establishment, through past tragedies overcome and triumphs celebrated. It shows the courageousness of Cantabrians who remained resolute after the recent earthquakes, and shares a vision for the future Christchurch. Glimpses of the personal story of the author's ancestors are threaded through each chapter, which takes the reader on a journey and highlights how events through the generations have touched the lives of all who call Canterbury home. The stunning imagery illustrates what Christchurch and Canterbury are still able to enjoy, and is combined with heartfelt messages from Cantabrians from all walks of life who openly share what they love about the people and their region, and their dreams for its future. It celebrates who we are and what we have. The messages from Cantabrians include those from the Prime Minister, the Mayor, All Black Dan Carter, All Black Captain Richie McCaw, Roger Sutton (Cera), firefighters, the Farmy Army and the founder of the Student Army. Each message is outstanding. Christchurch Dreaming also features exciting concepts for the new Christchurch from some of our most talented architects. They invite the reader to dream of the new options now available to Christchurch and Canterbury, and to also realise that nothing is impossible, for the positive spirit and determination that is so prevalent in Canterbury will turn those dreams into a reality. Christchurch Dreaming — a New Zealand story, from the heart. Christchurch Dreaming retails for 49.95 and orders for the new book can be made by e-mailing me directly or purchasing in all major bookstores from Friday October 14. The story of a couple of Kiwis who have always had difficulty taking "No" for an answer - particularly when it comes to making a dream or two come true. Journey with them on a wide variety of adventures in nursing, writing, publishing, mountain guiding and expeditions to some of the most distant parts of the planet. 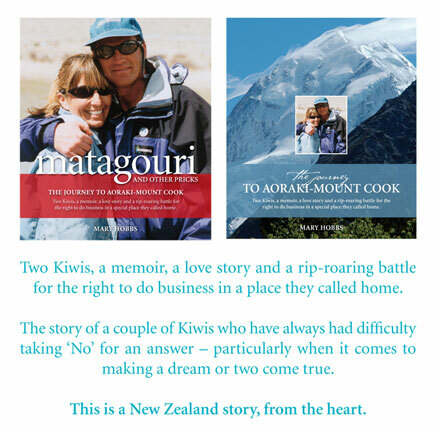 This story spans the personal journeys that led them to each other and to living at Aoraki-Mount Cook National Park. This special place they call home has a wild and raw beauty and is located at the head of the magnificent South Island high country, where the spectacular Southern Alps meet this remote, stunning landscape. It also recounts their rip-roaring David and Goliath battle to establish The Old Mountaineers' Cafe at Aoraki-Mount Cook against the opposition of an existing multimillion-dollar business and, in particular, the Department of Conservation. This is a New Zealand story, from the heart. New Zealander Mary Hobbs published the award-winning New Zealand Outside magazine for 10 years. she is the author of Kiwi Tucker for the Soul, a best-selling collection of inspirational stories about New Zealanders; Letters to New York and America, from New Zealand with Love, a non-political book of letters gifted to the american people and the President of the United states following the events of 9/11; and The Spirit of Mountaineering, about the early history of mountain guiding at Aoraki-Mount Cook. Mary and her husband Charlie live at Aoraki-Mount Cook, where they own a guiding company and The Old Mountaineers', an historical mountaineering-themed restaurant and gallery. The couple have two treasured daughters. They divide their time between The Old Mountaineers', adventures in the southern alps, expeditions to remote areas and publishing and writing books of inspiration. The Spirit of Mountaineering is the first in a series of four classic volumes on mountain guides in the Aoraki-Mt Cook region. This is the story of Jack Adamson, New Zealand's first-born mountain guide. Combined with over 90 rare images of the historic mountaineering era of the 1890s in a high quality 160-page publication, most New Zealanders with a love of our alpine regions and early pioneering days will want to include it in their library. Jack's story sets the record straight on some important mountaineering firsts in New Zealand and on errors contained in the rather infamous mountaineering book of EA Fitzgerald in 1896. The corrections are made using Jack Adamson's personal notes as the reference, which until now, have never been published. 'It is important stories like Jack's are passed on for generations to come, for we can travel with them and learn some hard-won lessons. It is particularly special to read of these experiences from the personal recollections of these early pioneers. For that reason, wherever possible, I have quoted directly from Jack's notes and other mountaineers of the era, to keep their words alive in a book that is accessible.' – Mary Hobbs. The Spirit of Mountaineering is largely an inspirational story of New Zealand's rich alpine history that will touch the heart of New Zealanders everywhere. Each of the four volumes on the spirit of mountaineering will focus on the spirit of exploration, endeavour and courage of mountain guides at Aoraki-Mount Cook. Many of the historic photos utilized required digital preservation. Purchasers of the four volumes will be assisting in the preservation of photos of the earliest eras of mountain guiding in New Zealand. To arrange an interview with the author or to order the book ($49.95 + post and packing), please email info@spirit-publishing.com or refer to contact details on this web site. Kiwi Tucker for the soul is a feel-good book that unashamedly celebrates the outstanding spirit of New Zealanders from all walks of life. A New Zealand classic. It is an inspiring collection of stories about the lives of some of New Zealand's most genuine people. Although widely different, their stories are bound together because they overcame different challenges in their quest to attain a goal or to realise their dreams. They take responsibility for their lives and share common values of integrity, honour, courage, a sense of duty, love of family and friends and self-reliance. (Kiwi= New Zealand and Tucker is a casual name for food.) Kiwi Tucker for the soul includes the recipe for a successful life from each person profiled. When the 9/11 tragedies occurred in America, Mary and Charlie Hobbs wanted to do something to help. The idea for a book of unknown friends from different continents reaching out to one another to help arrived - and refused to go away. Putting aside all other business, they got busy on publishing a collection of messages from New Zealanders from different walks of life. Many people helped in the effort - especially Gary Stewart of Ocean Design who contributed his expertise to the book in the form of many hours on design and layout. Tradescans and Rangiora Print were also very helpful. Letters to New York and America from New Zealand with Love features messages of inspiration and encouragement from a wide variety of classic New Zealanders. It is a unique book that bypasses all political and religious differences through its inclusion of all major religions. It simply celebrates the spirit of a people reaching out to others regardless of religion, colour, culture or political belief. It was written in the hope that it would bring the world a little closer and it touched hearts wherever it was received. In February 2003, at their own cost, Mary and Charlie flew to New York City and gifted it to fire-fighters and people who had worked on the rescue effort. On 14 February 2003, after appearing live on the Paula Zahn breakfast show, they flew to Washington and presented it at the White House. In March of 2003, the New Zealand Prime Minister Helen Clark, presented a copy of the book to the President of the United States in the Oval Office of the White House. A great many copies were gifted out, but some are still available. The remainder sell at $39.95 to help cover the costs that were involved and in the event there is a surplus a percentage of the proceeds will be contributed to families who lost loved ones. Charlie features in this video sharing his skills as a professional internationally qualified mountain and ski guide. All the basic mountaineering techniques are covered in a lively and easy-to-understand way. A classic mountaineering training DVD. $39.95. Mary Hobbs published this magazine for ten years. During that time it was awarded the first New Zealand Tourism Media Award, and also Magazine Front Cover of the Year. Sir Edmund Hillary recommended it as "...the most comprehensive outdoor guide to New Zealand that I have seen. It is an exceptional publication." Mary contributed a percentage of the income to help the environment, to help adventure operators in particularly difficult times, to encourage a love of the outdoors in school children, and to assist disadvantaged teenagers, some of whom were assisted to learn how to read through Applied Scholastics. Others were helped through Outward Bound courses and another was able to attend a Narconon course to get him off drugs naturally. A 'Win Your Dream Adventure Competition' was available to all school children. Every child who entered was encouraged to be inspired from the people featured in the stories of the magazine and each child won a prize. Mary sold the magazine to Wilderness in 2003, but her company retained some issues of the ten years she published the magazine. These are now collector's items and are available for sale at $19.95. 2001 Includes a tribute to the legendary pilot and adventurer Janey Blair, NZ Emmy award-winning film director and producer Mike Single on his intrepid journeys, Jacinda Amey and her rescue of a colleague from the jaws of a great white shark on Campbell Island, a profile on Todd Blackadder and the very inspiring mountain guide Anna Cook. 2002 Includes a journey through Nepal with Sir Edmund and Lady June Hillary, classic mountain guide of the 1880s at Mt Cook, Jack Adamson and his wife Nora, the first kayak expedition of the Antarctic Peninsula, an inspiring ski-race in Queenstown to help others, romantic holidays and kiwi food. 2003 winter Collectors' edition commemorating Sir Edmund Hillary's successful first summit of Mt Everest in 1953. Also profiles the Lord of the Rings Location guidebook, GM food dangers, a high country cavalcade and a profile of some adventurous free sprits who trace the Mekong river to its source and follow it down to the ocean. Mary Hobbs was writer and publisher of New Zealand Outside for ten years, an award-winning annual publication about New Zealand's magnificent outdoors and its incredible people. Married to well-known mountain and ski-guide Charlie Hobbs, Mary and Charlie have two daughters. They divide their time between Aoraki-Mt Cook village, where Charlie also owns and manages the wonderful historical restaurant, 'The Old Mountaineers, adventures in the spectacular Southern Alps, expeditions to remote areas from Tibet to Antarctica, and publishing and writing inspirational books.